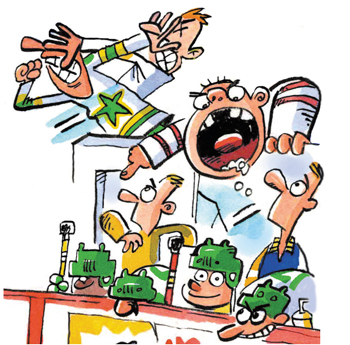 Wandering into the used hockey gear sale at my local arena with my five-year-old newbie player, I could already spot them: the Bad Hockey Parents. You know the ones. They’re overly passionate, they’re loud, and they’re more than a tad obnoxious. Did I mention that the boy with the squished head was six? I wanted to run in the other direction and convince my little super-skater to take up another sport this year. Like yoga. That way, I could pretty much guarantee that my weekends would be free of yahoo parents screaming in my ear whenever their child touched the puck. But my son worships the ice, so I sought out Bad Hockey Parent (BHP) experts for tips on how to avoid turning into one myself. Although BHPs are the exception to the rule, when they behave badly, it can ruin everybody’s fun. That’s why minor hockey leagues across the country have integrated parental behaviour codes as part of their mandates. The Grand Falls Minor Hockey Association in New Brunswick has a code of ethics for players, coaches, volunteers, referees and parents. In Ontario, the Timmins Minor Hockey Association’s protocol requires parents to sign a “recognition and prevention of abuse” policy before the season begins, and BHPs must take a course on how to prevent bullying, harassment and abuse. Hockey Alberta’s new Respect in Sport program, launched in March, features a one-hour online tutorial that illustrates how damaging parents’ overbearing, abusive attitudes can be. A hockey dad and coach in Airdrie, Alta., just north of Calgary, got so mad at a referee that he dropped his pants and mooned him. He was suspended. In Regina, a man spat on a woman in a rink, which erupted into a fight in the stands. A parent in Calgary whined that a nineyear-old child who had just been hit extremely hard and was lying on the ice was “faking it”. A Calgary hockey dad sat behind the opposing team’s goalie, and taunted him for an entire period. The goalie was nine. The dad? He got banned from the rink for the rest of the hockey tournament. In April, two Toronto fathers sued the Greater Toronto Hockey League, one of its clubs and four coaches for $25,000 because their 14-year old sons were cut from a midget junior A team. Over 70 players had tried to make the 17-man roster. ....then you may be a bad Hockey Parent! Parents and coaches weigh in on howto develop your inner Good Hockey Parent. Cheer for all the kids, not just your own. Support your coach; don’t undermine him in front of the players. If you have something to say to him, wait 24 hours, then discuss the issue in private. If you have a grievance with a coach involving your child’s safety, speak up immediately. Conduct yourself respectfully and responsibly. Think about how your child will feel if you are escorted out of the arena by security. Give the referee a break. Hockey is a fast sport, and no one can see everything. If you can’t keep your cool during a game, walk away, change seats, or leave the arena. Learn to let things go and move on. It’s a game, people! 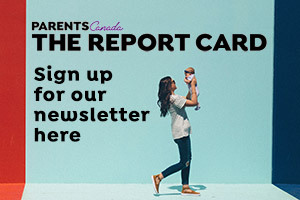 Wendy Helfenbaum is a writer and television producer in Montreal and wrote about parentpreneurs in our May 2010 issue. Visit her at taketwoproductions.ca.